Irish rugby fans could be forgiven for wanting a little rest after the Six Nations success but within two weeks of Twickenham they are facing a feast of rugby on their shores. An Easter extravaganza sees the four teams who have shared 10 of the last 12 European titles between them face off across two Champions Cup quarter-finals, with Connacht renewing their rivalry with Gloucester in the Challenge Cup for good measure. Bilbao beckons and this weekend will go a long way towards defining the seasons for Munster, Leinster and the western province. Only Wasps and Toulouse have broken the run of competition wins between these dynasty teams. Munster's 2006 and '08 wins were followed by Leinster's three in four between 2009 and 2012 before Toulon won three in a row and Saracens completed successive wins. Those running the provinces will hope the warm glow of Ireland's success and the calibre of opposition will help to fill Thomond Park, the Sportsground and the Aviva Stadium respectively while, for Johann van Graan, Leo Cullen and Kieran Keane, the mission is to re-integrate their star men as seamlessly as possible. Most of the Ireland front-liners were given last weekend off to enjoy the fruits of their labour, so preparation time will be limited this week as they re-adjust to their provincial systems. And yet they will arrive with supreme confidence having made history last weekend and, in Leinster in particular, in full knowledge that there is no guarantee that they'll be selected. The eastern province are the favourites to win a first title in six years after their barn-storming run to the quarter-finals. Their clash with Saracens is arguably the pick of the round, a re-match for so many of those who did battle at Twickenham last weekend and a meeting that Cullen's men will relish. Even when they were knocked out by Clermont at the semi-final stage last season, Leinster were lamenting the fact that they would not get a shot at Sarries. "We would have loved to have seen how close we could have gotten to Saracens and we don't get the chance now which is really gutting," Johnny Sexton said at the time in Lyon. The Irish province saved their best performance for the quarter-final last season, tearing Wasps asunder in Ballsbridge with a performance that had Stuart Lancaster's imprint all over it. That they fell at the next hurdle was a disappointment, but they strengthened over the summer with the arrival of southern hemisphere stars Scott Fardy and James Lowe, while their young guns are a year further down the track. In their way is a team who have not lost a knock-out game since the 2015 final in Cardiff. By their own high standards, Saracens are enduring a difficult campaign, but they have managed to keep their head above water in the Premiership and squeezed into the last eight. Their squad is packed full with experienced, talented operators who know what it takes to win at this level. It remains to be seen if they can pull things together for a once-off performance against Leinster, but they come bearing plenty of threats as they look to maintain their stranglehold on European rugby on Sunday. Twenty-four hours earlier, Sarries' predecessors as kingpins, Toulon, make their way to Limerick for the second time in their history. They suffered defeat in 2010, but the two organisations were ships in the night as the mega-rich French club built towards their period of supreme dominance and Munster lost their golden generation. They last met in the 2014 semi-finals and the survivors in red will be buoyed by their experience then. Toulon were at the height of their powers, but Rob Penney's team could and possibly should have beaten them. Both teams look very different now, but the French side remain a powerful outfit packed full of international quality. A six-day turnaround from a Top 14 clash with Clermont won't help their cause, but the options available to coach Fabien Galthie are scary; just try picking two centres from Ma'a Nonu, Malakai Fekitoa and Mathieu Bastareaud. Conrad Smith has played with both All Blacks, and against the France star, and believes their influence will be felt in a team that won't fear travelling to Thomond Park. "Toulon are coming good, they seem to do it most seasons, they may not start all that well, but they've got big-game players who are aware of their time of the year. They're starting to do well in the Top 14. They'll be well prepared for this game over here," he said. "They'll really enjoy (Thomond), they'll rise to the challenge, that will suit them. They were sitting outside the top six in the Top 14 not that long ago. But they've been a different side over the last few months." Munster are badly depleted in their backline, with Keith Earls and Chris Farrell gone after Six Nations injuries, while Chris Cloete is a big loss from their back-row. Without their internationals, their form has been mixed but they've always produced their best on European weekends at home and Saturday's win over Scarlets demonstrated real steel. Unfortunately, it may have come at a further cost with Tommy O'Donnell and Rory Scannell now doubts for Toulon. Still, they'll have watched how the PRO14 champions dealt with the big French side and will back their fitness and the leadership of Peter O'Mahony and Conor Murray who are riding high on Ireland success. For Connacht, the Challenge Cup offers the best chance of a qualifying for next year's Champions Cup and, after announcing a couple of exciting signings for next season, they'll be desperate to capitalise. 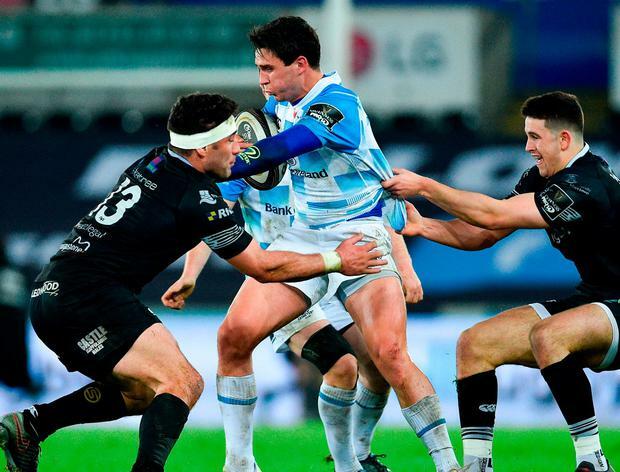 Kieran Keane's side have been enigmatic all season, but their European form has been solid. Fifth in the Premiership, Gloucester had a confidence-boosting come-from-behind win over London Irish at the weekend. They have realistic play-off ambitions on the domestic front, but they have plenty of depth to afford Johan Ackermann options. The early kick-off may limit the Sportsground's intimidation factor, while Friday's loss to Edinburgh was hardly the perfect preparation but they've been able to turn things around in these European weeks all season and know that this is a huge opportunity for them to keep their campaign alive. The same goes for all three Irish provinces involved. It's been a while since the Irish ruled Europe, but this weekend can go a long way to putting the provinces back at the top table.